The “Medical Sensors Market by Sensor Type” report estimates that the global market for sensors in healthcare applications will reach $15.01 billion by 2022. This analysis includes the use of pressure as well as temperature, chemical, flow, level, position, image and biosensors. In fact, low cost MEMS pressure sensors are one of the enabling factors for increased portable healthcare monitoring products.According to “Applications for Medical MEMS Pressure Sensors,” a MEMS Market Brief dated September 2012 from market research firm IHS, pressure sensors are by far the leading type of MEMS sensors in terms of revenues.In medical and healthcare applications, pressure sensors are used for several different measurements. Hospital and Portable Ventilators All Sensors has been supplying pressure sensors to leading ventilator and respiratory manufacturers across the world for over 10 years. Our reputation for excellence has been recognized by leaders of the medical industry that have employed All Sensors’ pressure sensors in critical-care products. For example, ventilators provide breathing assistance to patients who have sustained some type of serious injury or contracted an illness that prohibits normal breathing. As shown in Figure 1, a mixture of air and oxygen is delivered into the patient’s lungs via a tube placed into the patient’s mouth, nose or windpipe. Relatively low pressure (typically 10 cm H20) is monitored during this process to properly inflate the lungs when delivering air to the patient. Ventilators are commonly employed for critical patients in life-threatening situations. It is imperative that ventilator manufacturers utilize high quality pressure sensors (transducers) when designing their products to assure proper performance and reliability. All Sensors’ pressure sensors are currently used in hospital and infant ventilators, as well as portable ventilators. Figure 1. 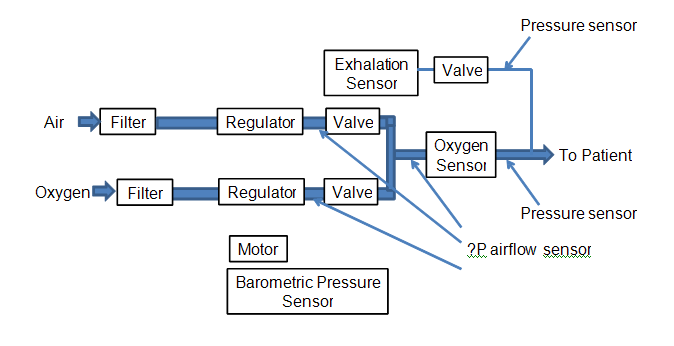 Typical components and potential locations for pressure sensors in a ventilator. Oxygen Concentrators and O2 Theropy Oxygen concentrators are used to provide oxygen therapy for patients. Oxygen therapy, also known as O2 therapy, is a medical treatment that provides higher levels of oxygen concentration to vital tissues and organs in the body. Patients who require higher oxygen concentration than naturally available in ambient air utilize oxygen concentrators to deliver oxygen-rich air. A few common illnesses that may require an oxygen concentrator device are asthma, chronic bronchitis, anemia, pulmonary edema and congestive heart failure. The low differential pressure measurements for flow are typically only a few kPA. Figure 2. An oxygen concentrator uses both delta-pressure measurements for flow and pressure sensing. Manufacturers of oxygen concentrator devices require pressure sensors that are both highly accurate and highly repeatable. This market consists of both commercial (hospital grade) and portable devices used in the home. As the world’s population ages and grows, so has the demand for oxygen concentrator devices. Oxygen concentrators are also used for other applications such as victims of smoke inhalation and other lung injuries. Patients undergoing surgical procedures also require concentrated oxygen before and after surgery. 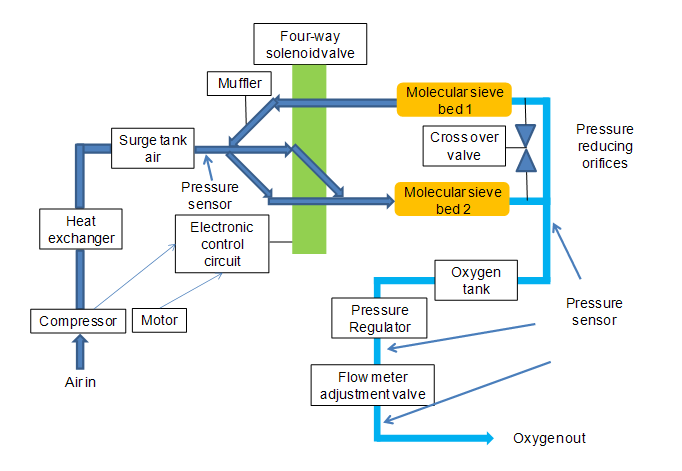 Medical pressure sensors measure the oxygen tank level (about 2,000 psi (136 Bar) or more)as well as the flow of oxygen (about 4 kPa) being delivered to the patient. Pressure sensors are alsorequired in the module that concentrates oxygen (typically 2 bar) directly from the atmosphere. Another form of oxygen therapy is known as Hyperbaric Oxygen Therapy (HBOT). HBOT is created by delivering compressed oxygen at higher than normal atmospheric pressure. This form of treatment is delivered to a patient inside a special sealed chamber that either has a hard or soft shell. The soft-shelled chamber is sealed and pressurized (from4.4 and 7.3 psi above atmospheric pressure) with the patient inside. HBO therapy used to treat ailments such as thermal burns, blockage in retinal artery, arterial gas embolism (AGE), carbon monoxide poisoning, gas gangrene along with traumatic brain injuries, chronic fatigue, immune dysfunction and more. Sleep apnea is a common disorder that affects people across the world. Sleep apnea consists of pauses or shallow breaths while sleeping. Disrupted breathing can occur for a few seconds to several minutes. These pauses disrupt sleeping patterns by pushing the patient from deep sleep into a light sleep. When this occurs, the patient experiences inadequate rest and drowsiness or tiredness throughout the day. This disorder commonly goes undiagnosed because it is undetectable during a normal doctor visitand is typically discovered by the patient’s sleeping partner. Not confined to the young or elderly, sleep apnea is found in patients in many different age groups. Untreated sleep apnea conditions are believed to increase the following conditions; high blood pressure, chance or heart attack, heart failure, and irregular heartbeats. Sleep apnea is commonly treated with a medical device known as a CPAP (Continuous Positive Airway Pressure) machine. As shown in Figure 3, this device works by applying positive pressure to the patient’s airway. This device is attached to the patient with a face mask to deliver air at a positive pressure during sleep. Patients need to wear this device every time they sleep. Medical pressure sensors (typically4kPa) are used to measure the positive airflow to the patient. Figure 3. Treating sleep apnea requires differential pressure sensors for flow measurements and low pressure sensors. Operating Room and More Beyond the applications that have already been discussed, pressure sensors are used in a variety of medical products. Many of these devices assist doctors in hospital operating rooms. Gauge or differential pressure measurement can then be used to calculate volumetric flow rates as well as fluid, gas or air volumes.Additional examples ofmedical products that use pressure measurements for monitoring and/or control include: drug delivery systems, spirometry devices used to measure lung capability, invasive and noninvasive and in vivo and ex vivo blood pressure, monitoring of gastrointestinal (GI) internal pressure during abdominal surgical procedures and post op eye surgery care as well as intraocular pressure (IOP) measurements for treating glaucoma. 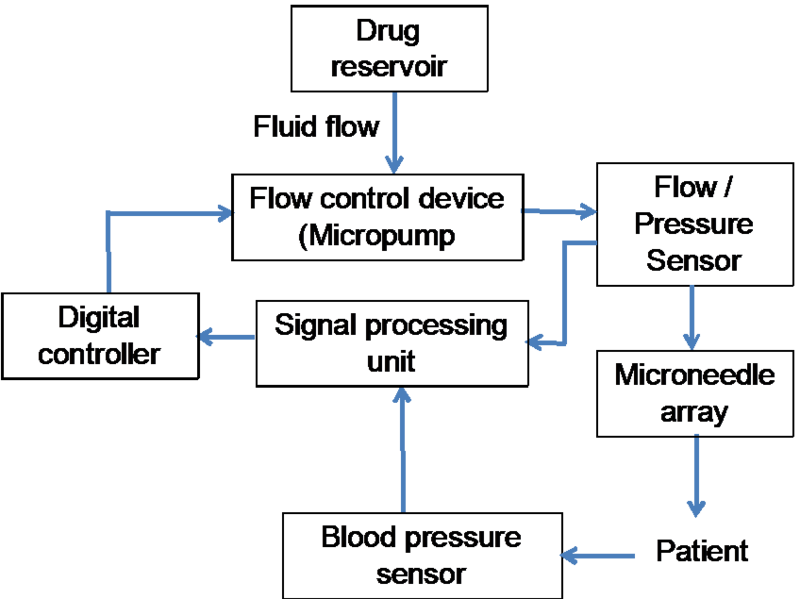 Figure 4 shows an electronic drug delivery system and the associated pressure measurements. Blood pressure can be lower (90/60 mmHg) than normal (120/80 mmHg) for patients with hypotension and higher (140/90 mmHg or above) for patients with hypertension (high blood pressure). In the steady-state blood pressure measurement, the higher reading is called systolic and measures the pressure when the heart beats. The lower reading is called diastolic and measures the pressure between heartbeats. For some advanced blood pressure and other medical readings, the wave shape provides additional diagnostic details.Table 1 show a summary of common medical applications for pressure sensors. Figure 4. Pressure sensing measurements in a digitally-controlled drug delivery system. Table 1. Common medical pressure measurements versus type of measurement and typical value.